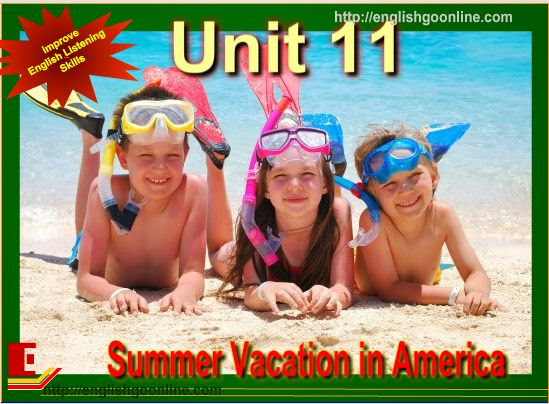 In this lesson, you will learn the way talking about Summer Vacation In America. Everyone should own a sports car Why does the American school year start in September and end in June? It's something of a mystery. Did children once "bring in the harvest" on the family farm all summer in the distant rural past? What is she going to do� in her Summer vacation ? This summer will be fun. Grace is going to visit her Grandparents. The cottage is on Lake Erie. Grace is going to swim. She is going to play board games. She is going to talk with her grandparents. Grace is going to have fun. Grace is going to a summer camp. She will sleep in a cabin. She will make lots of new friends. Grace will learn campfire songs. Grace is going to Cape Cod with her parents. We are going for two weeks. We are going to drive. Grace will see the ocean. Cape Cod will be beautiful.